Monday morning, my alarm went off and I was already an hour into my run. I'd woken up super early, full of energy for some reason (that reason was probably that I fell asleep well before the sun set on Sunday). I was running some solo miles at Cobbs Hill and the lights encircling the reservoir gave me two shadows, a lighter one and a darker one. It struck me as funny, like I was being shadowed by past versions of me. I've been running Cobbs since high school cross country (in the 90s! For real, I am that old). Every apartment or house I've lived in as an adult has been within running distance of the park. 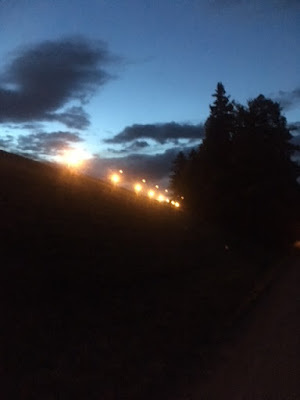 There are so many past versions of me running countless miles and countless hill repeats there. Alone. With friends. At all hours of the day and night. But the version of me I'm always seeking when I go there is the one that's an unstoppable force. It's this underlying force of grit and determination and stubbornness. But it's also a force of optimism and love and infinite gratitude. I never knew where it came from, I just knew it was always there, whenever I needed it. As my feet and mind wandered around and around, up and down, I was thinking about some of the low points in my life and I realized those were the times that led me to the high points, and especially to the all the very best people. Then on the RIO radio show Monday night, we were talking about running an aid station and Eric said the difference between a good aid station and a great aid station is that at a great aid station, the volunteers are out in front of the table instead of behind it. They're not waiting for the runners to come up to them, they're out greeting runners as they come in, taking their water bottles to fill and asking what they need. It really resonated with me, because looking back on my life, I've been extremely fortunate to know so many in-front-of-the-table people. Parents, friends, strangers, dogs (dogs are actually beyond in-front-of-the-table - they're at jumping-all-over-you-like-you're-the-best-thing-they've-ever-seen level). In the ultra of my life, all the aid stations I stumbled into, tired and starving and achy and crying, were filled with all these amazing people who asked what I needed, or just knew what I needed even when I didn't know myself. And Eric's words resonated with me because that's the kind of person I want to be. I want to tap into that unstoppable force and be filled with so much happiness and gratitude and love of life that I can spend as much time as possible out in front of the table, passing it on. I want to be better so that I have more to give back. If you run enough, if you live enough, you will hit low points. You will face struggles and pain and you will wonder if you have what it takes to go on. You do. You most definitely do. Here, come into this aid station. You look great, you can do this. Here's some water, here's some snacks, here's a high five. What do you need? Lyric of the moment: "Sometimes a bolt of light comes through the sadness. That there is a reason for the madness. And somehow it stirs a joy within me. And I understand that the root of pain is beauty...In my dreams you are alive and breathing..." ~Youth Group "In My Dreams"